We all get a little anxious to start planting when the snow is gone and the sun is warm and bright. Even in cold northern zones there are some things you can plant before the last spring frost. But wait just a minute! Don’t even be walking in your gardens while the soil is still wet and squishy!. Saturated spring soil is great for the plants in the ground, but not for a gardener stomping around. And certainly not good for planting. Wait for the soil to dry out and become workable before you plant anything. If you squeeze a handful of garden soil and it sticks together in a clump it is too wet for planting. You will wind up with compacted soil, making it difficult for plant roots to take in air, water and nutrients. Soil that forms a crumbly clump is ready. But while you wait, you can fill your patio pots and containers with fresh potting soil and get started with the most frost tolerant plants. So what can be planted after the soil thaws out before the last frost of spring? Lots of things actually, and certain seeds can even be sown as soon as the snow is melted (see Direct Sow Seeds for lists of what can be planted early). Since most of us are anxious to see colorful flowers, lets start with annuals for immediate blooms. Cold hardy annuals can brighten up your deck and patio, front entry and window boxes, and your gardens and landscape early in the season before the last frost of spring. Cold tolerant annuals can survive and even thrive through repeated frosts, a couple annuals even tolerate freezing down to the mid 20’s. These can be a little different than cool season annuals, which simply prefer cool weather and do not perform well when it gets warmer. All cool season annuals are not necessary frost hardy, so be careful with your selections. If you really want to plant annuals while it is still likely to hard freeze overnight, you need to stick to containers that can easily be moved into a shed or the garage when a hard freeze threatens. Window boxes attached to the house and up off the ground usually stay a bit warmer since the coldest air settles to the ground, so they can usually be planted early, but a hard freeze may still damage or even kill your plants, so keep that in mind. You may also have a few little nooks and crannies around the house that are protected from wind and retain some warmth from the house, but keep in mind you may risk those plants too in a hard freeze. And note that air temperature is taken a few feet off the ground. The coldest air settles at ground level so it will be colder at the soil surface than the recorded or forecast temperatures. Cold air will also tend to flow to low spots, so planting on a slope provides some protection from the coldest temperatures. Cold tolerant annuals that you have grown from seed indoors will need to be slowly acclimated to the cooler temperatures outdoors. Put the plants outdoors during the day for several days once it reaches 40 degrees or more. After several days you should be able to leave them out over night, but be sure to bring them inside if the temperature will drop below 40 degrees. After a few continuous days and nights outdoors go ahead and plant them in containers or garden beds after the freeze danger is passed. When cold tolerant blooming annuals are purchased from a garden center, be sure they have been hardened off. If not, or if in doubt, slowly acclimate them to the cool outdoor temperatures as above. Pansies and Violas (these are the same species including pansy, violet, viola and Johnny jump-up) are a cool season annual that are also cold tolerant. These are the first annuals that can be planted 4-6 weeks before the last frost date and will withstand several degrees below freezing. These are great annuals not just for spring, but also for autumn. Pansies and violas can also be planted in winter in warm regions. Bachelor’s Button are cold tolerant and so are the seedlings. You can direct sow bachelor’s button seeds about 2-3 weeks before the last spring frost. Bachelor’s button may likely even survive as well as pansies. Calendula (pot marigold or English Marigold) are cold tolerant and can be planted before the last spring frost. Coreopsis, annual are cold tolerant and can be planted 2-3 weeks before the last spring frost. Dracaena (spike) are cold tolerant and can be planted before the last spring frost. Dusty Miller are cold tolerant and can be planted before the last spring frost. Forget Me Not are cold tolerant and so are the seedlings. You can direct sow forget me not seeds about 2-3 weeks before the last spring frost. Gazania are somewhat similar to Gerbera Daisies but are frost tolerant. The flowers will close at night and heavily overcast days, but bloom repeatedly if deadheaded. Godetia are cold tolerant and can be planted before the last spring frost. Larkspur are a cool season annual, cold tolerant and so are the seedlings. You can direct sow larkspur seeds about 2-3 weeks before the last spring frost. Marigold seeds are cold tolerant so you can direct sow marigold seeds about 1-2 weeks before the last spring frost. But the plant will take a while to grow and bloom. Osteopermum (African Daisy) are cold tolerant and can be planted about 2-3 weeks before the last spring frost. Poppy are cold tolerant and so are the seedlings. You can direct sow poppy seeds about 2-3 weeks before the last spring frost. Snapdragon love cool climates and will tolerate light frosts. The seedlings are also cold tolerant. Snapdragon looks terrific in fall too. You can direct sow snapdragon seeds about 2-3 weeks before the last spring frost. Sunflower seeds are cold tolerant so you can direct sow sunflower seeds about 1-2 weeks before the last spring frost. But the plant will take a while to grow and bloom. Sweet Alyssum seeds are cold tolerant. You can direct sow alyssum seeds about 1-2 weeks before the last spring frost, but it will take a while for the plant to grow and bloom. Or buy plants and use them as a great filler with tall potted flowers or garden edging. Sweet Peas are cold tolerant and so are the seedlings. You can direct sow sweet pea seeds about 2-3 weeks before the last spring frost. Verbena are cold tolerant and bloom very well in cool weather. But they will also be blooming and healthy all summer right through fall frosts. There are also a few warm season annuals that will hold up very well against a light frost, especially if planted up off the ground in containers and window boxes. Annual geraniums and petunias seem to be the most frost tolerant of the warm season annuals. I fill my front window boxes and entry pots with petunias, geraniums and dracaena spikes so the front of the house looks great from very early spring until very late fall. To test your favorite annuals, just see what happens to them after the first fall frost to decide if you can plant them early in the spring. Perennials can sometimes be purchased at garden centers already in bloom, or ready to bloom. Or you may have seeded frost tolerant perennials indoors or potted some up to overwinter in the house. Those that are frost tolerant can be planted 2-3 weeks before before the last spring frost to give you some immediate color and interest in your gardens or containers. Be aware though, that they may need to be acclimated to the cold weather. They may have been in a greenhouse and then probably had some protection at the garden centers. Place them outdoors during the day when the temperature is at least 40 degrees for several days. Be sure to bring the inside if the temperature is expected to fall below 40 degress. After several days you should be able to leave them out over night. After a few continuous days and nights outdoors, go ahead and plant them. Although a frost tolerant perennial plant will not be bothered by frost, the flowers are not always so tolerant, so just be aware of that risk. A quick light frost may have no affect, but a heavier frost that settles deeply for several hours overnight could damage the blooms. Temperatures of 25-28 degrees for several hours is considered a freeze or killing frost and the blooms will be damaged, and possibly the foliage will even have to be cut back. As noted above, if you plant in containers, window boxes, protected areas or on a slope where the cold air will flow down and away from the plants, you may escape frost and even freeze damage. Lily bulbs are usually available in bloom at garden centers. The flowers will usually withstand a light frost. 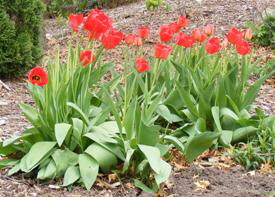 Tulip bulbs are usually available in bloom at garden centers. The flowers can withstand down to 25 degrees if not for an extended period. Daffodil bulbs are usually available in bloom at garden centers. The flowers can withstand down to 25 degrees if not for an extended period. Coneflower blooms are likely to survive a frost. Dianthus (pinks) blooms will survive frost. Foxglove blooms are likely to survive a frost. Hollyhock blooms are likely to survive a frost. Larkspur blooms are likely to survive a frost. Phlox blooms may survive a light frost. Rudbeckia (Black eyed Susan) blooms will survive frost. Salvia blooms are likely to survive a frost. Shasta Daisy blooms are likely to survive a frost. Verbena blooms are likely to survive a frost. Roses, both potted and bare root, can be planted as soon as the soil is thawed and workable and the danger of killing frost is over. Plant roses without worrying about frost. Be sure to see the instructions for planting roses. Dormant or bare root plants are often available VERY early in spring at some nurseries and local garden centers. You probably won’t find any at the “big box” centers, but you can also order a very wide variety of dormant plants online. Bare root shrubs and trees in particular can save you a lot of money. The nursery can keep them compactly stored over winter without soil and they don’t require any labor in spring to pot them up or keep them growing, saving them AND you some money. And don’t be afraid to order even trees mail order or online, I have several trees that were packaged beautifully for shipment and became thriving healthy trees. Dormant or bare root plants, perennials, roses, shrubs and trees, are dug up by the nursery in early winter and the soil is all removed from the roots. They pack the roots in damp material such as wood shavings and put them in cold storage until they are shipped in very early spring. When selecting dormant plants, avoid anything that has sprouted if possible. New growth will be susceptible to frost damage. But generally if you see any growth on bare root plants it is because you are shopping at the very end of the ideal bare root season and they need to get planted NOW. Also make sure that the root packing is moist but not soaked. Dried roots may be damaged and could have trouble getting growing. Wet roots could be rotting (make sure they are not moldy or black) or have induced pre-mature sprouting. Dormant plants are shipped or sold only when your region is ready for planting. This would be as soon as the soil is thawed and workable. Remember, the plants or dormant - not awake yet, so you can plant them no matter what the temperature. But do plant them as quickly as possible, the roots dry out extremely quickly. If you are not able to plant immediately, follow the temporary storage directions that came with the plant. When you are able to plant them, soak the roots in a bucket of water to refresh them while you prepare your planting holes. And be sure to water the soil thoroughly after you plant. Watering again won’t be necessary until the plant is growing and using the water. Wait to mulch and fertilize until the plant is growing too. If you are planting a dormant bare root tree, be sure to see the special instructions for information about breaking dormancy and planting. So you planted all kinds of blooming annuals and perennials and suddenly a hard frost or freeze is predicted. Now what? Never fear, you can protect them. As a matter of fact many of us take these steps frequently in spring “just in case”, we wouldn’t want to risk losing all those blooms after our planting work! And once you get set up for it, putting protection measures in place is quick and easy. The first thing you will want to do to protect your plants from frost or freezing is water them. Much of the damage from freezing is really caused by dessication (drying out). Then you need to cover the plants. 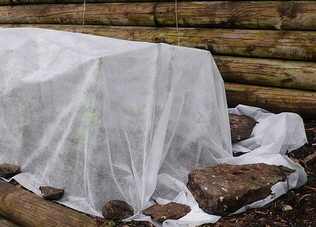 A cover will prevent the cold air from settling on and around the plants. A cover that reaches the ground all the way around the plant will also trap heat around your plant. Small sprouts can be covered with a pail or bucket, or deli containers that you have been saving (you did save some didn’t you?). If it is windy, press the container into the soil a bit so it stays put. Larger plants or large areas can be covered with a seed blanket (lightweight frost cloth available at garden centers) or a sheet or blanket. Set up some sort of framework if possible to drape the sheet over and prevent touching the plants. I just use my tomato cages. The sheets should also be anchored to the ground, it won’t take much of a breeze to displace them or blow them right off. Anchor the sheets with landscape fabric pins or rocks. If you used several sheets to cover a large area, you might want to pin them together to prevent a breeze from catching. I use clothespins and clip them to the tomato cages. Be sure and remove the coverings as soon as it warms up a bit. A frosty spring morning is a colorful sight in my neighborhood with all the old bedsheets draped over everything. !